If you’ve ever insured with us before, or visited us online, you may have noticed that things are looking very different lately. We decided it was about time that we updated our website, and you’re looking at the result. At Qualitas we’ve always prided ourselves on the level of care and service we provide our clients with, and this is something we feel should extend to our website too. After all, for some people, our website is the first connection they have with us so we want to make sure it is easy to use and easy to understand. We’ve updated our look, so it’s easier for you to find exactly what you’re looking for, and we’ve also included more information on our products and services to help you with your own research. 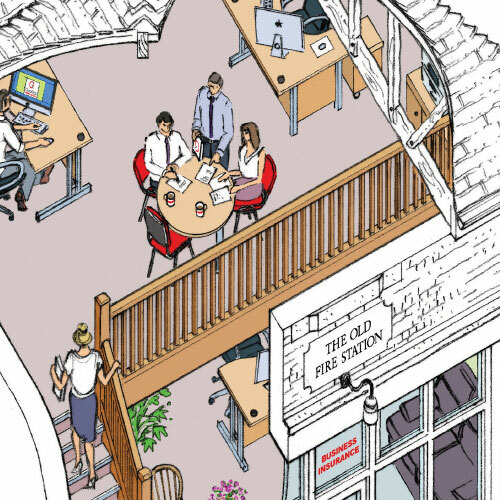 As well as redesigning our site, we’ve commissioned some new artwork from artist and illustrator Richard Marsh, including one piece which takes a look directly into our office in the Old Fire Station. We think these drawings look fantastic and we hope you like them too. Another thing we’re keen to do to expand our service is making it easier for you to keep up to date with the latest news from Qualitas, and for us to talk directly to you about the things that matter. Because of this, we have started this new blog which we’ll be updating regularly with news, articles, and anything else that we feel could be useful to you. We also have links to our Twitter and LinkedIn profiles at the top and bottom of the page, so if you want to join us there we’re just a click away. We hope our new website makes it easier for you to find what you’re looking for but we want you to remember that you can always reach us on 01684 217555 if you want to ask us anything, or email us at team@quib.co.uk if you prefer and we’ll be happy to help you. Please visit Richard Marsh’s website if you would like to see more of his work.